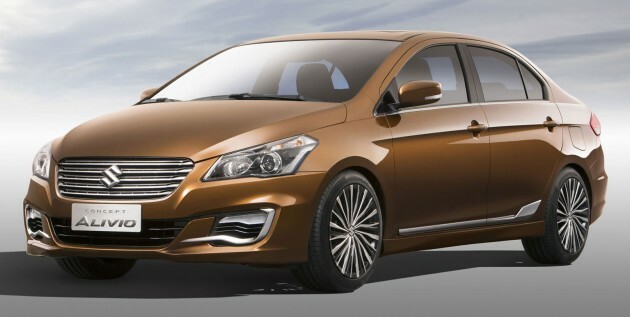 We’ve seen the Suzuki Authentics concept at Shanghai 2013 and its identical twin, the Maruti Suzuki Ciaz, in Delhi earlier this year. Now the company has returned to China to showcase the Suzuki Concept Alivio – which previews a new SX4-based sedan – at Auto China 2014 in Beijing. Measuring 4,545 mm long, 1,730 mm wide and 1,475 mm tall, the Alivio has grown to a full C-segment sedan competitor to take on the likes of the Honda Civic and Toyota Corolla, being 45 mm longer and 85 than the old segment-straddling SX4 Sedan (width remains the same). This leaves the Swift-based Dzire as the company’s sole B-segment entry. Looking a lot more production-ready than the earlier concepts, the Alivio is expected to remain much the same when it reaches the market, losing only the large wheels and some of the chrome trim. It certainly looks more conventional and balanced than the rather ungainly SX4 Sedan, that’s for sure. 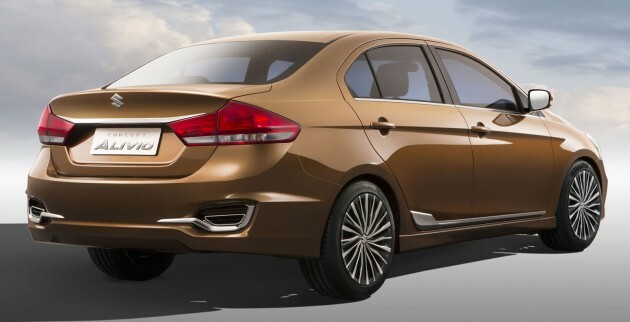 Powering the Alivio is a 1.6 litre DOHC VVT inline-four engine (likely the SX4’s M16A engine) which Suzuki claims has increased performance and fuel efficiency due to a reduction of weight and frictional resistance. Currently, the engine in the SX4 produces 120 PS at 6,000 rpm and 156 Nm at 4,400 rpm. The engine is mated to a new lightweight and compact six-speed automatic that promises improved efficiency. The production version of the Suzuki Concept Alivio is set to be unveiled for the Chinese and Indian market sometime later this year. What do you think – should it be brought over here to take on Malaysia’s competitive market? errkk…. New Honda City rear lamp????? Suzuki here under DRB group dealership. Let Proton rebadge it as new Preve lah! I think there’s something in your eyes for a few of the car similarities you mentioned. I’m not talking about the P Suprima and BMW 3-series combo. haha.. that why he mentioned “one day maybe”. howeverr, the potong is asia BMW what, so there is a possibility..
Proton should enter the Indian market. Because it looks and drives like the Ambassador. Suzuki are always something unique in the car world. T&H too uncle for you? H&K(not the gun manufecturer) to K-pop for you? All the Euros will bankrupt your wallet for maintanence in the long run?Really don’t want your next car to be a Glorious Malaysian Proton or Perodua?… well than theres the SS(Subaru and Suzuki, not the Nazi special unit)….and also Mazda. Their cars are always a little quirky and out of place, I mean seriously which segment does the SX-4 or Kizashi sits? They provide very nice alternative to other makes but will I think forever remains that, an alternative. And I do like the SX-4 , the Swift is a charming looking car and espacially love the Kizashi(the only Japanese car with a Japanese name, Mitsuoka aside), but I see almost no reason why I want one over a Civic or an Accord. This concept Alivio is a rather nice looking car despite the City rear end, which fits well due to the larger width. It may work well in China, but in Malaysia, I think it’ll just be that, an alternative to the establish brands. Bring this in, and discard the Kizashi. At least this stands more chance at winning more customers. Not too sure about other countries but, the only model that Suzuki can do well in Malaysia is the Swift. The SX4, despite having fairly good looks and decent handling, can never outdo models like the Jazz (or even the oddball Livina X Gear), and don’t even mention the weird looking sedan. I hardly see any Kizashis on the road either, they look really great but the car is too cramped for a D-seg (not sure whether it’s a C-seg or not, judging from the space). Perhaps the Kizashi is meant to be a proper sports sedan, which doesn’t really have a market here in South East Asia. Suzuki makes really great models honestly, but they just can’t do well on the sales chart. That joke is no longer funny. Actually, I don’t think it was ever funny in the first place. Yeah you are right. Peugeot in Malaysia are run by rapists. yes. bring it in. more competition benefits the buyer. To challenge for the C-segment market, Suzuki should offer at least two engine choices for this car though – the 1.6 L and 2.0L engines. Actually it’s Suzuki who came out first with that rear lamp design, judging from the previous sedan concept (forgot the name) it was based upon.Anyway Alivio sedan could certainly be a very interesting proposition in the burgeoning Malaysian C-Segment market.The car’s styling is quite nice and expect the handling department to closely match the best in C-Segment namely Mazda, Ford & VW. Bring it over Suzuki! Bring in the s cross please, Suzuki Malaysia.